Pan Gai Noon (half hard half soft) was a Chinese style back in the early part of the last century. This style had roots in Shaolin, and was taught predominately in the Fukien province of China by various monks. A Japanese fellow named Kanbun Uechi went to China, presumably to study and possibly help in the family shipping business. In China he sought out schools of the martial arts, and ended up studying Pan Gai Noon. After studying for several years, he opened up his own school of martial arts, making him possibly the first Japanese to teach Martial arts in china. During a dispute over a border, one of his students struck a man. One punch, one kill. Kanbun Uechi felt responsible for this episode, and so gave up the martial arts and returned to Japan. For 17 years he refused to teach martial arts, but, finally, a friend managed to get him to ‘open his fists,’ and the world received a true blessing in this true and original martial art. 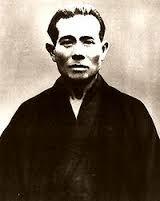 Pan Gai Noon would become known as Uechi Ryu, and it would become one of the three main karate influences of the world.